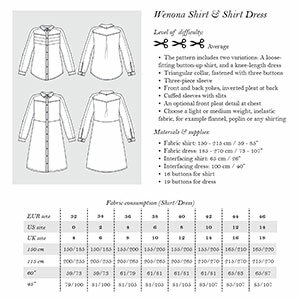 The Wenona Shirt and Shirt Dress pattern includes two versions: A loose-fitting button-up shirt and a knee-length dress. Both versions feature a triangular collar that fastens with three buttons, a three-piece sleeve with cuffs and slits and front and back yokes with an inverted pleat in the back. 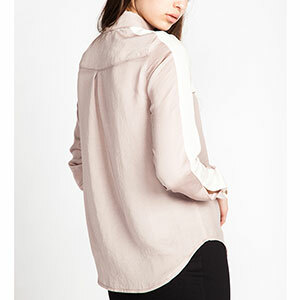 Also included is an optional front pleat detail on the chest. Suggested fabrics are light to medium weight wovens such as flannel, crepe de chine, rayon challis, peach skin or lawn.